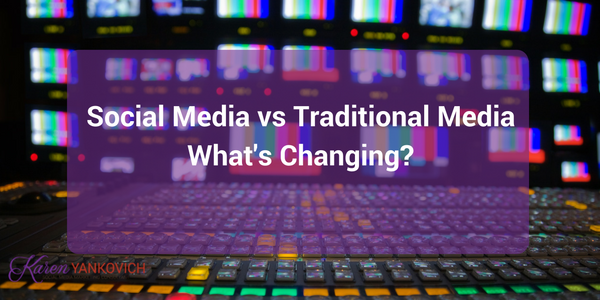 Social Media vs Traditional Media – What’s Changing? I think it’s safe to make the call that lately, social media is becoming its own subset of traditional media in more ways than ever before. While traditional media has its place, you know you can’t let yourself slip behind with changing times; it’s important to stay on top of trends so you can consistently reach your audience in the most effective way possible. When combined, social media and traditional media make for massive business visibility and exposure. But if you’re like a lot of people out there, making the switch from traditional to social can be overwhelming. So how do you even BEGIN to make that transition? Don’t worry–I’m here to help. But first, let’s talk about some of the ways social media is dominating the marketing space and how you can embrace the shift too. Unlike television news delivery where you sit down, turn on the TV, and watch to hear about stories, social media makes it possible for news to come directly to you on your computer or smartphone. Social media sites produce steady, up-to-date news on your feed in an instant–all you have to do is scroll through and read what you want to read. What’s even better is that social media presents the option to subscribe to news channels and have the news come straight to your phone in the form of a notification. What’s the takeaway? Make your social channels valuable. Encourage your audience to subscribe to your social channels. Provide them with incentives to subscribe and run frequent time-sensitive deals or offers. They’ll want to receive information from their favorites businesses first, and you’re rewarding them for doing so. Works out for both parties! Facebook recently came out with a commercial – yes, a commercial! It’s not often that you see social media sites advertising on TV, but this commercial encouraged use of their new live streaming. Have you seen that notification on your Facebook app yet that says “so and so just went live!” yet? Yep, that’s it. That’s live streaming. This feature can allow the normal person to jump on Facebook and report about anything while being live. People use this feature to show their Facebook users all kinds of things; for example, I’ve seen reporters live across the world talking with communities and SHOWING what the communities and lives are like. We’re on the scene when news is HAPPENING–not just when it’s being reported. Many of these news stories aren’t breaking through traditional news sources because of the turnaround of many articles. They’re breaking through viral videos and viral news, straight from the sources and the people involved, not secondary sources. And remember, news is subjective. It doesn’t always have to be about large scale things in the country and overseas and politics etc. Local events are considered news as well. While the average person can use Facebook live for just about anything, businesses are finding creative ways to use this as well. Whether it’s tutorials, information sessions, customer experiences (you name it), people are tuning in to watch Facebook live streams left and right. My realtor clients are showing sneak peeks of upcoming open houses on live stream. Restaurants are taking you into the kitchen to meet the chef. Photographers are taking you behind the scenes of their photo shoots! Jump on this fast for your business and be creative. People will tune in if you give them a good reason watch. Typically, news shows last an entire hour, which mean if you want to hear the story about a certain subject, you either have to wait until the end or you might miss it right in the beginning. That’s why video content is taking over the news industry. People can easily go on to the Facebook site of a news channel, look at a headline, and choose whether or not they want to watch it. From there, you can get a news story that you actually want to watch in about 2 or 3 minutes. Not only is video content good for spreading news, but this taps into Facebook Live; people can view the entire amount of time you spent live, even after you finish recording. Are you catching my drift? If not, let me break it down: it’s a great medium for your business when you want to show your audience your “news”. If someone can’t catch you live at that moment, they’ll be able to see it later on in their own time. Video content is also capturing the younger generations. If a news story is too long or takes too much of their time, they’ll tune out and not want to watch. That means faster is better. People ”want it now”. Are you still sitting down to watch the news uninterrupted? Providing shorter clips in the form of videos on your timeline is a more 21st century solution to the always-on-the-go generation. If you have more to say that can’t fit into the shorter video, you can still direct them back to your site to read an entire article or watch a longer video in more detail. But trust me– shorter will perform better. Now let’s implement this into your business; here are my quick tips. Provide value to your customers. Share info about how your business can help people. Share events and activities that your customers and followers can benefit from knowing about. Interact with your customers on social media, because it will show up on their pages and spread news about your business to their friends and followers. It will also help you connect with your followers! Listen to your followers. Figure out what they want and deliver information they want to hear. Retweet sources about your niche and target audience. People visit and use your business because they want something from you, so give them information they need, for free. Social media is a goldmine for free advertising; if you give your audience what they want, they will give you want, which is a strong customer relationship, and business! ALWAYS double check your sources… And then double check them again. With the power of social media and people having their own voice to speak out, stories can be misleading with wrong or unreliable facts. Make sure whatever you share comes from a largely reliable, ethical source that fact checks. Build connections. Networking with individuals who are educated about topics you support is a great way to bring exposure to your business. Work with them, gain from their knowledge, and give them something in return (for example, a feature in your store or on your website through social media). Both of you will gain coverage on social and a wider targeted audience. With all of this being said– make sure you don’t do this INSTEAD of using traditional media. Social media is not a replacement; it’s a necessary supplement to your marketing strategy that will help you fully reach your target demographic. For the most influential positioning above your competitors, you have to do both. Find the balance and run with it; it won’t be long before you start to notice benefits. Comment below! Tell me how you are using social media and traditional media together. I love hearing YOUR stories! And don’t forget to join my free Facebook group, Get Seen Be Heard; come ask questions, talk social media strategy, and spark game-changing ideas for upping your business’ success surrounded by a community of like-minded (not to mention, incredibly friendly) professionals. I’ll talk to you soon!